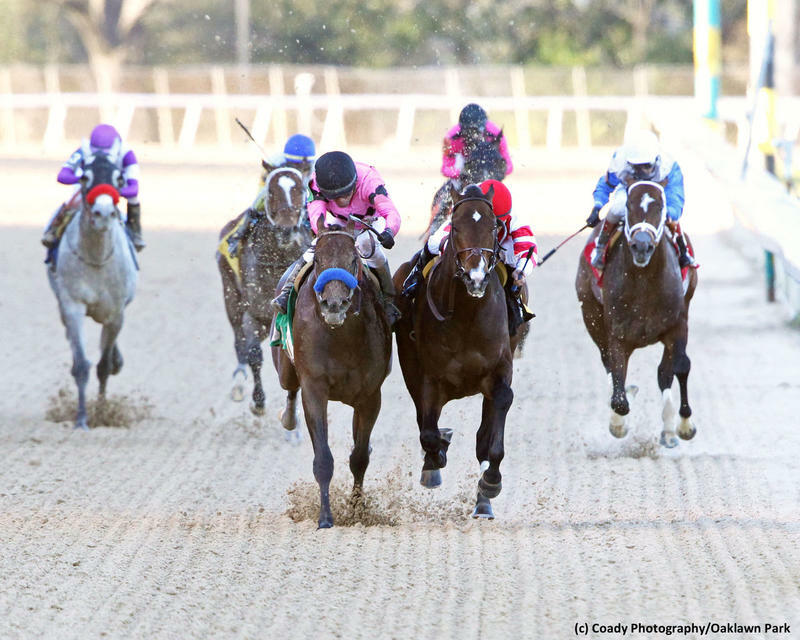 Fox Hill Farm’s Omaha Beach picked up 37.5 points on the Road to the Kentucky Derby with his game tally in the second division of the $750,000 Rebel Stakes (G2) at Oaklawn Park on Saturday. The improving colt held off champion Game Winner late in finishing off 1 1/16 miles in 1:42.42 to earn his initial stakes win. Omaha Beach debuted at Del Mar in September in a one-mile maiden special weight event on the grass. The dark bay colt was a closing third while being sent postward as the even-money favorite at first asking. He had two more races as a juvenile, both on the lawn, and he finished a close second on each occasion. The Richard Mandella trainee was transferred to the main surface for his sophomore bow and was a half-length second to the highly rated Nolo Contesto at Santa Anita Park, finishing eight lengths clear of his nearest foe in a fine effort. Omaha Beach broke his maiden second off the bench when decimating his foes in a seven-furlong maiden special weight race in the slop on February 2. The Rebel marked the stakes debut for the fine prospect. The son of War Front has increased his BRIS Speed rating in every lifetime start and has additional room for improvement. Since moving to the dirt he has earned respectable figures of 94-96-98, and judging by his performance on Saturday the colt has more to offer. Omaha Beach won the Rebel almost solely on his own accord. Jockey Mike Smith never seriously asked the Kentucky-bred until a few jumps before the wire, and the stubborn three-year-old never let Game Winner by, even past the wire, as he galloped out well in front of the champion. He was bred by the Charming Syndicate and hails from a superb immediate family. The budding superstar is out of the Seeking the Gold mare Charming and is a half-brother to 2014 champion two-year-old filly Take Charge Brandi. Charming is out of Broodmare of the Year and multiple Grade 1 queen Take Charge Lady, which makes her a half-sister to 2013 Rebel Stakes (G2) winner Will Take Charge, who was honored as that year’s champion three-year-old male, as well as 2012 Florida Derby (G1) star Take Charge Indy, both of whom are sires. Rick Porter of Fox Hill Farm acquired Omaha Beach at the 2017 Keeneland September Yearling Sale, purchasing him privately from the Eaton Sales consignment after the colt was a $625,000 RNA. Porter decided that the well-bred War Front yearling would go to Mandella following the acquisition and quipped, "Richard is already in the Hall of Fame, but I told him there’s a higher Hall of Fame, for trainers who can win the Kentucky Derby with a War Front." Time will tell if Mandella can reach Porter’s so-called “higher Hall of Fame,” but Omaha Beach looks like the kind of horse to get him there.